I have found this incredibly moving piece on being the parent of a perpetrator and survivor of sibling abuse. What is most distressing is the judgement the parents are experiencing and the lack of support and action by authorities. When will people take this abuse seriously? Why should the victims horrendous experiences be dismissed in this way because of the fact her abuser was her sister. As long as this keeps being swept under the carpet in this way nothing will change to tackle this dangerous form of abuse. One of the most distressing things for a parent will be the realisation that there is sexual abuse between their children. This leaflet is produced by MOSAC, an incredible organisation working with mothers of sexually abused children. I come back to gas lighting a lot as it is a form of emotional abuse I feel people need to be more aware of. There are two things in this post that particularly strike me. 1 – being told how you feel. I wonder if people notice how common this is in everyday conversation, not ones that are necessarily deliberately manipulative. For example someone is telling an experience to a friend and will be answer with “you must feel..” or “you will be feeling…”. The more aware of it the more I notice it, both inside and outside my counselling room. What is it that makes us want to define someone else’s feelings rather than give them space to share them? Is it because listening might be too painful? Does this type of interaction which is incredibly common add to the lack of awareness of gas lighting and other forms of emotional abuse? 2 – feeling that being sensitive makes you unlovable. When did being sensitive become a weakness or indeed a personality flaw? Why is this un-acceptable in society? Sensitivity to me is about being in touch with your feelings and experiencing them all, whether painful or not. 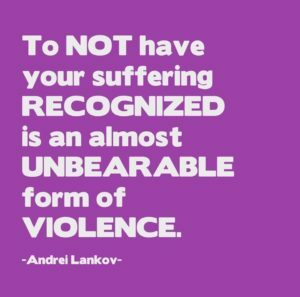 Yet admitting to feeling pain, hurt or upset is deemed wrong. It should all be swept under the carpet. I see a lot of damage caused by this where clients have to fit a mould and try and be something they aren’t to meet approval from others. I have written about gas lighting before. It doesn’t always happen within romantic relationships, its also common within families and even friendship groups. This powerful article describes what its like. The new year is starting and thousands of young people are going away to University and College for the first time. This should be a exciting, nervous and hopefully fun and rewarding time. Sadly though there will be a lot of people who will suffer sexual assault. This article has the staggering statistic that 3 in 5 are assaulted or harassed. Revolt Sexual Assault is a UK based charity working to expose the scale and campaign for change. You will also find a list of support organisation for those who need it on their website. Its so important that male victims of domestic abuse are finally getting more attention in the news. This article details some of the statistics and difficulties men have accessing support due to how limited the resources are to help them. It also has a link to an program that will be available on iPlayer from tomorrow and I am keen to watch that as well when it is released. I am affiliated with an organisation, MenCASA which promotes awareness and training in this area for therapists. It also is a resource for clients to use to be able to find a counsellor to work with who will take their experiences seriously. There are as many types of emotionally abusive relationships as there are types of abuse. Parent to child, partners, friends, work colleagues, but one that doesn’t get a lot of attention is between siblings. These can be full, half or step siblings involved and while it’s usually the older siblings abusing the younger it isn’t always the case. Name calling and belittling, being excluded, being made to feel worthless. All this things will have long lasting consequences to the victim. Low self esteem, a need to put others first, a need to never make mistakes. What doesn’t get noticed though is quite often the underlying message of not feeling loveable. After all, if your own siblings hate you and treat you so badly there must be something wrong with you? The child experiencing this is going to internalise this sort of message very young. They are being abused by siblings they love and look up to. They don’t have the ability to rationalise that the problem isn’t them. So they will grow up with this message embedded deep inside as a self concept, even if they never name it. There is a good chance they will never even realise that their experiences were abusive. After all everyone knows siblings can be difficult and sibling rivalry is normal.So it may well be downplayed and minimised by other members of the family whilst the low self esteem it created has a lifelong impact. So what can be done to help? The first step is to really reflect on where you are? Do you find yourself always trying to put others needs before your own? Do you find it difficult to be with your siblings or have lost contact completely? Do you jokingly say my sibling always hated me and try and pretend that didn’t hurt! Starting to explore that relationship can help you look at the current and past situations from a different perspective and give you the insights to change things in the future. It may be a painful experience but hopefully it will be worthwhile. This article on abuse contains a video click I’ve seen a few times, but each time I watch it I find it distressing. What impact does neglect and abuse have long term for adults? The cycles of abuse can continue for generations, to work on changing that can be the work of a life time but changing things, no matter how difficult can help break the cycles. Do you understand emotional abuse understand what it is? For me in many ways, it is one person expecting another to put them first – even though that could be detrimental to the other person. We all want to be important enough to another person that they want to put us first, it is the behaviour that follows comes with the expectation that can lead to abuse. Put it another way; we would allow and encourage someone to put us first ahead of what is healthy and necessary for them or what they would really choose to do if they felt they could. Using tactics like manipulation, coercion, threats, emotional blackmail, attacking the sense of self and self-worth of another. To deliberately dismiss their values and their rights, their boundaries and autonomy. I consider it very similar to a parent child relationship; a child is demanding and expecting of their needs to be met by their parent. However, as they age, hopefully they develop self-awareness and empathy for others and learn they can’t have everything they want no matter what the cost to others. What happens if they don’t give us what we want? What impact does that have on other relationships? Can they even see what they are expecting and that their behaviour is abusive? I think is part of why it’s so hard to recognise it sometimes. We have some blind spots with parent child relationships, but also, we might not just be the victim of it but we might also be the perpetrator. Where is the line that you will or won’t cross? For example, knowing you want to do something with your partner that they don’t want to do but finding a way to change their mind. Why aren’t you respecting their wishes? What were you prepared to do to get your own way? How much emotional pressure did you use to get what you wanted even though you knew they would be unhappy? How often have you insisted a friend or family member put your needs first, even though they didn’t want to? This leads to another question that is very uncomfortable to explore – why? Why can’t we accept someone saying no to us? Why can’t we accept that other people come first at times? My experiences lead me to the conclusion that there is a great deal of insecurity and fear underlying a lot of this behaviour. Things can be changed, but recognising what is happening is necessary as a first step. I came across the image below and I found it incredibly powerful. While it applies to any form of suffering, it is very common for the abuse between siblings to be ignored or dismissed. Society tends to downplay problems between siblings and categorise them as normal family dynamics. They are not always normal though. Emotional, physical and sexual abuse all have long term impacts on the victim and when people around you act as if nothing bad happened it can be devastating. On top of that you are also expected to remain in a relationship with your abuser by family and friends. This adds another layer of violence to what has already been suffered.